As a fellowship trained spine surgeon, Dr. Jatana specializes in treatment of complex disorders of the cervical spine. He has special training in the cervical spine and treats patients who require repeat or revision surgery. During surgery, Dr. Jatana employs spinal cord monitoring techniques and a microscope to facilitate safety and accuracy. His goal is to accurately identify the pain source so that surgery is successful in alleviating the symptoms. After surgery, Dr. Jatana prefers to follow his patients for at least two years to ensure long-term positive results. He completed his residency at Harbor-UCLA Medical Center and was Chief Resident of the Department of Orthopedics. Dr. Jatana is a Diplomate for the American Board of Orthopedic Surgery and a Fellow for the American Academy of Orthopedic Surgeons. His memberships include North American Spine Society, Arapahoe Medical Society, Colorado Medical Society, Colorado Orthopedic Society and Denver Medical Society. 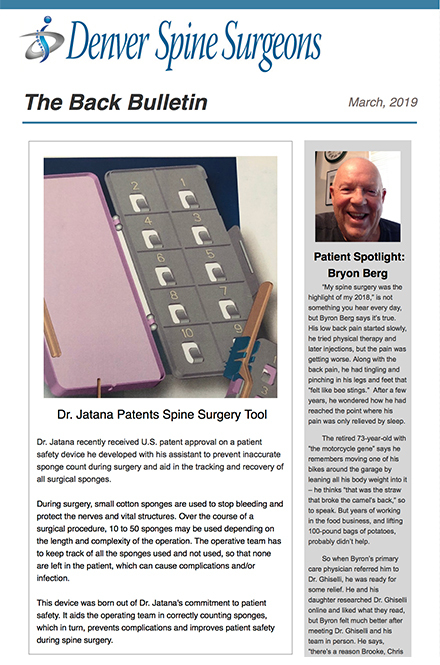 Visit Dr. Jatana's personal website to learn more and read patient testimonials.